The tactical level of war is the level of war at which battles and engagements are planned and executed to achieve military objectives assigned to tactical units or task forces (JP 3-0). Activities at this level focus on the ordered arrangement and maneuver of combat elements in relation to each other and to the enemy to achieve combat objectives. It is important to understand tactics within the context of the levels of war. The strategic and operational levels provide the context for tactical operations. Without this context, tactical operations are reduced to a series of disconnected and unfocused actions. 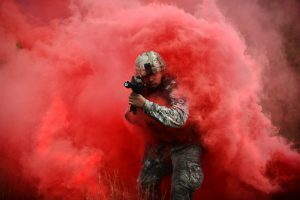 Members of the 106th Rescue Wing Security Forces Squadron maneuver through concealing smoke. During this training, airmen learned to react to enemy contact and IED attacks, with an emphasis on immediate combat care. Individuals, Crews, and Small Units. Individuals, crews, and small units act at the tactical level. At times, their actions may produce strategic or operational effects. However, this does not mean these elements are acting at the strategic or operational level. Actions are not strategic unless they contribute directly to achieving the strategic end state. Similarly, actions are considered operational only if they are directly related to operational movement or the sequencing of battles and engagements. The level at which an action occurs is determined by the perspective of the echelon in terms of planning, preparation, and execution. Battles, Engagements and Small-Unit Actions. Tactics is the employment and ordered arrangement of forces in relation to each other. Through tactics, commanders use combat power to accomplish missions. The tactical-level commander uses combat power in battles, engagements, and small-unit actions. A battle consists of a set of related engagements that lasts longer and involves larger forces than an engagement. Battles can affect the course of a campaign or major operation. An engagement is a tactical conflict, usually between opposing, lower echelons maneuver forces (JP 1-02). Engagements are typically conducted at brigade level and below. They are usually short, executed in terms of minutes, hours, or days.